The AeroPress may be a small coffee maker but it’s is one of the most flexible coffee makers on the market. Depending on the recipe, you can brew anything from a single cup of coffee to concentrated espresso-like coffee. The entire brewing process for the AeroPress takes about 30 seconds. After pouring coffee and hot water into the AeroPress chamber, set the chamber on top of your coffee cup and press. The coffee will be pressed through a paper filter and into your coffee mug. Once you’re done brewing your coffee, just tap off the grounds and give the AeroPress a quick rinse and let dry. Durable, easy to clean and portable. The AeroPress comes with a paddle for stirring, 350 microfilters and plastic filter holder, funnel and coffee scoop. It’s ideal for travel, the office for in the kitchen. 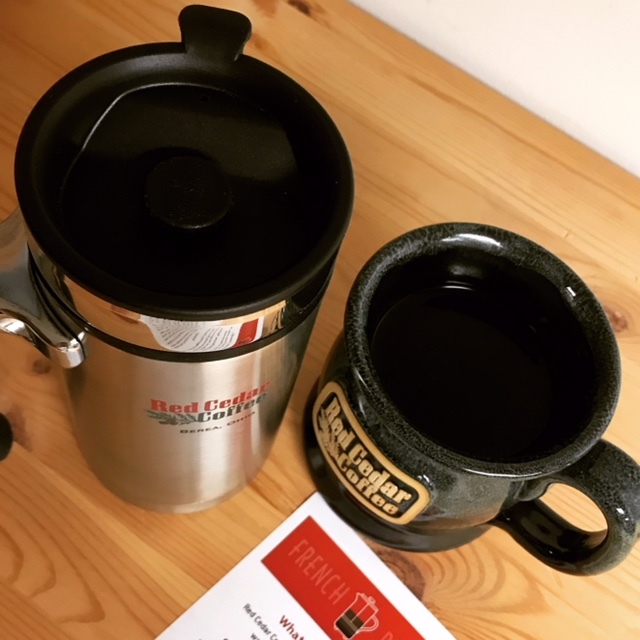 Freshly roasted coffee from Red Cedar Coffee Co. If you enjoy tweaking your coffee brewing recipes check out the recipes on the World Aeropress Championship website. 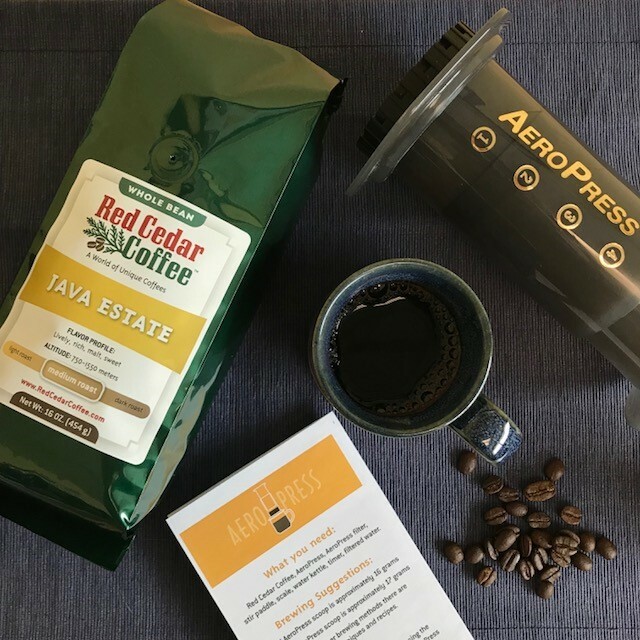 The AeroPress kit and replacement coffee filters are available at Red Cedar Coffee Co.’s Tasting Room in Berea. January 28, 2019 /by Anne D.
The Hario v60 is one of the easiest ways to brew coffee 1-3 cups of coffee at a time. Small and portable the Hario v60 has become a favorite brewing method for the office and for those that brew their coffee on the road. The small ridges of the v60 help the filter from sticking to the walls of the dripper. The Hario v60 is great for bright coffees where you can pick up floral and fruity notes. The Hario v60 is one of the easiest and most approachable brew methods. It takes up minimal space and the cleanup is easy since you are brewing directly into the cup. The Hario v60 brews coffee is a shorter time, approximately 3 minutes per cup. Use a digital scale to repeat your favorite coffee recipe. A good starting point for your coffee to water ratio is 1:16. Use 1 ounce of coffee to 16 ounces of water. Tweak the ratio to your liking. We offer the Hario v60 in ceramic and plastic along with Hario v60 #2 filters. October 17, 2018 /by Anne D.
You’ve taken the time to select your coffee and now you’ve brought them home. Now how do you store your coffee? Here are four helpful tips for storing your coffee beans. The original packaging does a pretty good job keeping your coffee beans fresh. When you purchase coffee from Red Cedar Coffee Co. you will notice a little one-way valve on the front of your bag. This valve releases gas from the coffee beans while keeping oxygen out of the bag. The foil bag protects the coffee beans from moisture and light. It’s always best to open one bag of coffee at a time. Grind your coffee right before you brew. To maximize the lifetime and flavors of your coffee you will want to grind your coffee right before brewing it. Coffee grinding releases gases and aromas which are important when you brew coffee. Keep your coffee at room temperature. Coffee beans can be sensitive to temperature, moisture and air. Keep your coffee away from spices as coffee can quickly absorb odors. We suggest keeping your coffee beans at room temperature out of direct sunlight. Airtight containers are coffee’s best friend. The best way to keep your coffee fresh is to remove the air from your storage container. Our Tasting Room has a selection of Airscape containers. We love that the Airscape container has an inner lid with air-valve that forces air out and locks freshness in. The Airscape works great for both whole bean and ground coffee which makes us love it even more. Our Tasting Room stocks two models of Airscape containers: a ceramic version with bamboo lid and a stainless-steel version. September 24, 2018 /by Anne D.
The French press brews a full-bodied cup of coffee coffee. If you’re looking to pick up more of the characteristics that make your coffee unique, this is your brew method! The French press is an immersion brewing method, meaning that the coffee grounds are steeped in hot water before being pressed to the bottom by a metal filter. You will want to use a coarse grind for brewing your French press coffee. Pour the amount of coffee you’d like into the press then add hot water. Place the lid on top of the French press with the metal filter up. Wait 4-6 minutes and press the metal filter down. Pour and enjoy! It’s a great brewing method to relax and enjoy your coffee. We find that steeping your coffee for 4-6 minutes is the sweet spot. Our Tasting Room carries double-walled stainless-steel French presses. The French presses have new technologies that create a barrier between the coffee and coffee grounds meaning you won’t have to worry about bitter coffee. Also pictured is a handmade stoneware mug. August 23, 2018 /by Anne D.
Grinding your coffee beans fresh is one of the best ways to brew a more flavorful cup of coffee. Coffee begins to start losing some of its flavor and aromatics as soon as it is ground. If you like to have the flexibility of grinding for different brewing devices or wish to get the most flavor out of your coffee, you may want to consider grinding your coffee before brewing. Blade grinders heat the coffee as they operate due to friction. Many blade grinders have a button that must be held down to grind; depending on who is grinding the coffee, it is much hard to achieve a consistent grind on a blade grinder. Burr grinders have two revolving abrasive surfaces (“burrs”) and in between which the coffee is ground. Burr grinders slice through coffee beans more consistently which is best for brewing flavorful coffee. Burr grinders help you brew coffee-shop quality coffee at your home or office. The Red Cedar Coffee Co. Tasting Room features two burr grinders models: Baratza Encore and Baratza Virtuoso grinders. The Encore is a great entry level burr grinder. The Encore features 40 grind settings. It is lighter and has a small enough footprint that it will fit under standard kitchen cabinets. 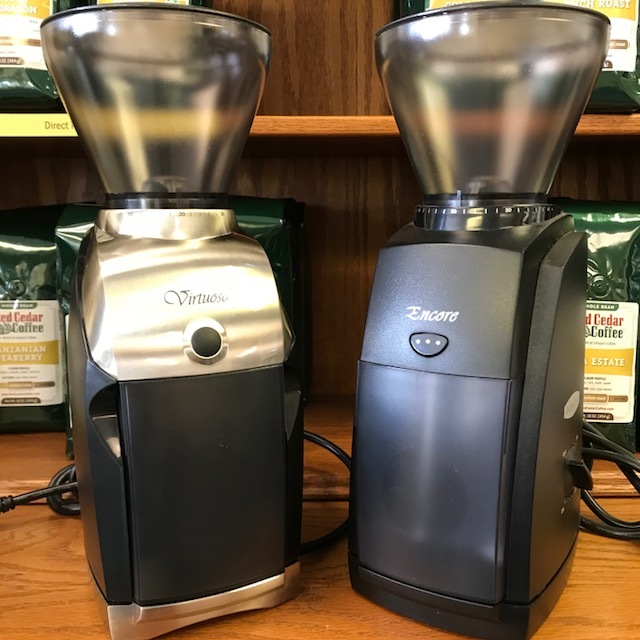 The Virtuoso grinds coffee faster compared to the Encore and features a 60-second timed grind switch which is helpful when keeping coffee beans in the hopper. The Virtuoso also has 40 grind settings, however the Virtuoso grinds coffee more consistently for drip, pour over and espresso. Keep your burr grinder in tip-top-shape! Oils accumulate over time and using the Full Circle grinder cleaning tablet can help you get the most life out of your coffee grinder. The grinder tablets have been formulated specifically to remove the coffee oils and residue on the grinder’s burrs and can also prevent jamming of the grinder. Here’s a short article that explains how jams occur and how a little cleaning can prevent them. The Full Circle grinder tablets we carry in the Tasting Room are food-grade safe and are the same quality of cleaner we use for our grinders. May 25, 2018 /1 Comment/by Anne D.
“What is that?” is a question we often overhear during our coffee tastings when we brew coffee using a Chemex. And for many reasons it is one of our favorite ways to brew coffee. This brew method is a piece of art that is represented in numerous art museums including the Corning Museum of Glass and Museum of Modern Art (MOMA) in New York. Invented by chemist Dr. Peter Schlumbohm in 1941, the Chemex combines the beauty of an hour glass with the function of a coffee maker. What makes this piece of art even more impressive is that it brews consistently smooth coffee. Why do we like the Chemex? The double bonded Chemex paper filter removes a molecule in coffee oils which creates a clean cup of coffee free from bitterness. The Chemex does especially well in with washed coffees like our Guatemala Antigua and Costa Rica La Lia Finca Dragon. We carry the 8-cup (40 ounce) Chemex and coffee filters in our Tasting Room in Berea, Ohio. Brewing Tip: Use a digital scale when using a Chemex for accuracy. 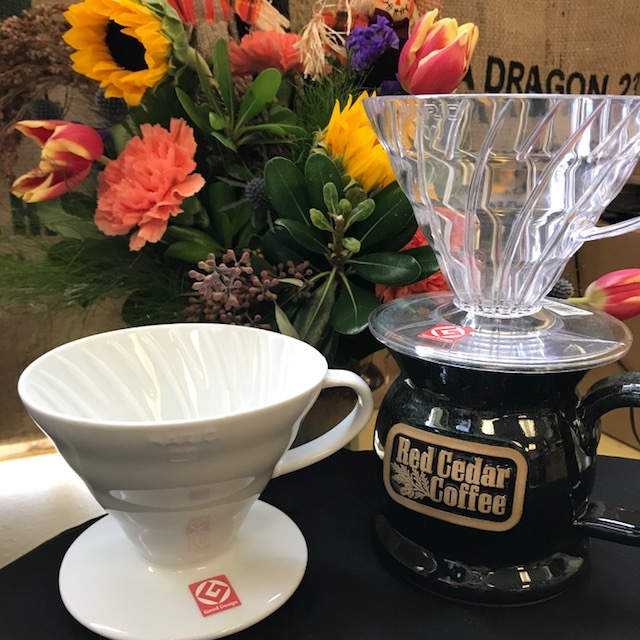 February 13, 2018 /by Anne D.
If you have attended one of our coffee tastings at our Red Cedar Coffee Co. tasting room in Berea, Ohio, you may have noticed that for pour over (i.e. Chemex, Hario) and emersion (i.e. French press) coffee brewing methods we use a digital scale. Did you know we also use a digital scale when brewing using a drip coffee maker? Brewing using a digital scale helps to brew coffee with consistency and accuracy. It’s a small step that is extremely helpful to make sure that you are replicating the same brewing recipe each time. Oftentimes a brewing recipe will show a brewing ratio such as 1:16 (one-ounce coffee to 16 ounces water). For pour over and emersion brewing methods we place the brewer onto the digital scale, tare the weight with coffee, and then weight out the amount of water we use to brew our coffee. Using the digital scale means you have more control in the amount of water you use. This can be helpful when using a 40 oz. Chemex to brew only 16 oz. 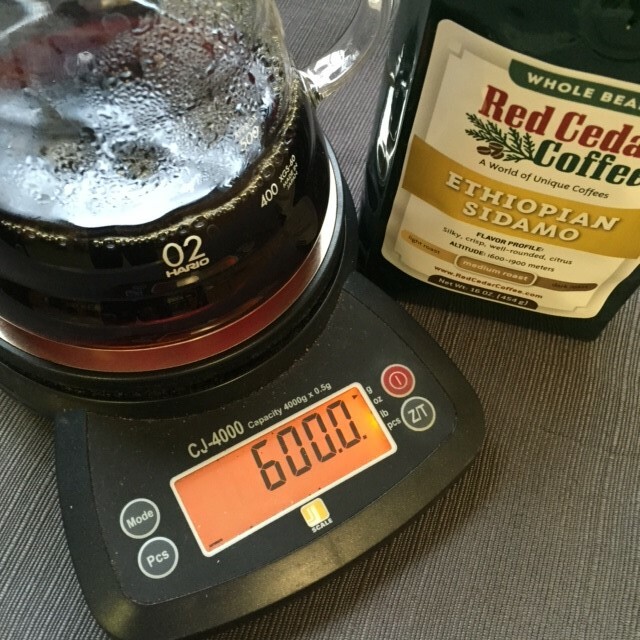 Red Cedar Coffee Co. carries a Hario digital scale in the tasting room. January 22, 2018 /by Anne D.